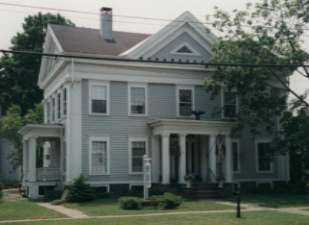 The Candlelight Inn Bed & Breakfast is furnished in Federal style decor (c.1828), and is subtly elegant, not pretentious. We provide our guests with charming rooms, private baths, TVs, and air conditioning. We are also known for serving a delicious breakfast in our elegant setting. Our scones are a particular favorite. The Candlelight Inn B&B is a small village inn, just a 10 minute drive to Ithaca and Cortland, 12 minutes to Cornell University, and 12 minutes to Greek Peak ski area. Candlelight Inn is listed on the National Register of Historic Places. Some of the places to visit while you are here: Cornell University, Cornell University Lab of Ornithology, Ithaca College, Moosewood Restaurant, NY State Parks, Corning Museum of Glass, The Cayuga Wine Trail, Seneca Lake Wine Trail, Greek Peak Ski Resort and a local Ithaca wine maker: Six Mile Creek Vineyards. See more on our "Local Links" page. We are a member of Bed &Breakfast of Greater Ithaca.